From South Ken to Shoreditch, from Jermyn Street to Mare Street – these days anyone that’s anyone is wearing red trousers. If you want your leg-coverings to let the world know that you’ve got a few quid and don’t care who knows it, or that you have some big ideas about what’s on at the ICA right now - or simply that you are completely insane (but in a mainly non-stabby way) - then you’d better get your wife or girlfriend to take those jeans and chinos down to the charity shop post-haste! Because there’s only one type of trousers you’ll be wanting to wear, and that’s RED TROUSERS. 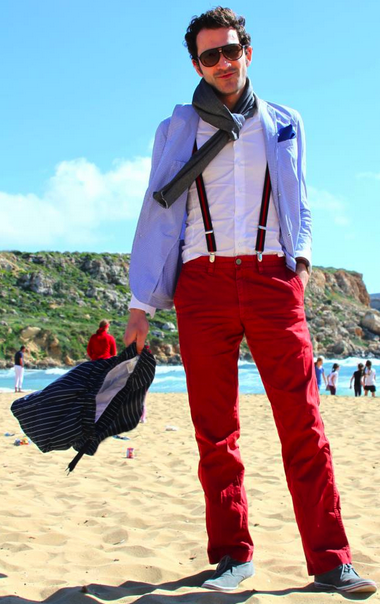 In fact - if you can’t wear red trousers you’d be better off wearing NO TROUSERS AT ALL. That’s what I say. There ain't no party like a South Ken party!